Fillauer North Carolina's C-Fab (formerly OTS Corp.) specializes in orthotic fabrication, including KAFOs, AFOs, and CROW boots. We accept casts or molds. Contact us to learn more. With over 80 years of fabrication expertise, Fillauer's C-Fab in Chattanooga specializes in prosthetic and orthotic fabrication, including upper- and lower-limb prostheses, RGOs, KAFOs, and AFOs. We accept scans and casts. Visit our website for order forms. Hersco is a full-line central fab facility. We make a complete range of devices, including custom foot orthotics, AFOs, Richie Braces, ankle gauntlets, and traditional metal and leather uprights. We have a passion for service and quality that extends over 75 years. Our lab accepts digital scans and digital files. We are first in customer satisfaction and orthopedic excellence. Practitioners who deliver adjustable sockets report fewer remakes and better outcomes. Patients in adjustable sockets report greater comfort and better fit. RevoLabs developed the Revofit adjustable socket technology and has a reputation as prosthetic problem solvers and innovators. We fabricate upper- and lower-limb prostheses and high-performance sockets. Visit our website or email us at info@revo-labs.com. Titan O&P Fabrications is an ABC-accredited central fabrication facility. Titan O&P Fabrication focuses on quality and craftsmanship. Every day we create one-of-a-kind laminations your patient will be proud to wear. Our specialties are graphics and fully customized laminated prostheses. Check out our Instagram to see current projects in the lab. Visit our website or call to discuss how Team Titan can help you with your fabrication needs. Solati Health designs and fabricates only the best-inclass custom cushion liners to meet the needs of your patients. We call it "the craft of comfort." With over 70 years of experience, a craft passed down from generation to generation, we've perfected the craft of comfort. We believe one size fits no one and that all amputees deserve an interface liner customized for their unique anatomy. We have a team of experienced practitioners, technicians, and customer service representatives at our custom solutions facility ready to provide a unique and customized experience that drive better patient outcomes. Who is a good candidate for a Fuzion product? Patients that typically have challenges with standard plastic orthotic braces due to spasticity or bony prominences. Save $45 per unit by taking advantage of our prep discount. You'll receive the device unfinished, allowing for your specific trim lines. And to reduce bulk, ask about our low-profile Spiro, HEKO, and dual action joints. Call today. Naked Prosthetics designs and manufactures high-quality prosthetic devices specifically for finger loss. Our mission is to assist people with digit amputation(s) and positively impact their lives with fully articulating, custom finger prostheses. Our product aims to restore the ability to perform most tasks, supporting job retention and an active lifestyle. Our customers have lost fingers to power tools, equipment malfunctions, injury in the line of military service, random accidents, and infections; in some cases, multiple digits have been lost. Historically, finger prostheses have been considered a second tier of prosthetics due to the lack of meaningful functionality. NP now provides a viable functional prosthesis versus a passive cosmetic solution. Our prostheses are intentionally left uncovered because we believe innovative technology should be displayed with pride. NP has three biomechanical products designed to replace partial loss of the thumb and fingers. Our design mimics finger motion and utilizes the remainder of an amputee's digit to power the device. Each device is custom designed to within millimeters of a patient's unique hand structure to provide the dexterity and small size required to successfully mimic the function of a finger. In most cases, our device restores the function of an amputee's hand and allows individuals to resume all normal activities related to work and play. Any combination of our devices can be worn at once. With WillowWood's high-quality custom fabrication services, clinicians may send us their fabrication work in order to have more time with their patients. We craft every item to exacting standards. We accept casts and CAD files, provide reliable delivery, offer free personalization, and have no hidden fees. With fabrication facilities in Ohio and Utah, we can provide timely shipping to just about anywhere in the United States. The Ferrier Coupler provides options and is self-aligning. It enables the patient a complete quick disconnect or interchange in seconds without losing alignment or removing garments. It also allows for a temporary replacement limb. Models are available for most mounts. The Terra-Round access foot mounts directly inside a standard 30mm pylon. The center stem flexes to allow the unit to conform to uneven terrain. It is water resistant and has a replaceable traction base pad. Protosthetics is the first central fab facility in the United States to be based solely on 3D printing and CAD/CAM manufacturing. This means lower costs, shorter lead times, and repeatable, predictable quality each and every time. We are based on digital but bring traditional craftsmanship to the table when necessary. Want to know what the future of central fab looks like? Trust the experts and give us a try—we are anxious to impress you and your team. Email us at contact@protosthetics.com. Give us the opportunity to lessen the demands of your in-house fabrication team so your clinicians can devote more of their time to their patients and/or marketing new referral sources. Our highly trained technicians at Anatomical Concepts can provide a wide variety of custom-made lower-limb orthoses such as thermoplastic AFOs, KOs, and KAFOs, as well as functional and accommodative foot orthotics. Any of our AFOs from our pre-fabricated PRAFO® family can be implemented to any custom-made KAFO system due to their unique modular designs for exceptional stability and patient comfort. For more information, email info@anatomicalconceptsinc.com. CFAB RESOURCES: Comfort Products Inc.
Cascade Dafo, creator of the original DAFO® (Dynamic Ankle Foot Orthosis), has added two new products to its Fast Fit® line of shoe inserts and JumpStart® orthoses. The Fast Fit Bug™ is a low-profile orthosis designed to control mild to moderate pronation with an optimal amount of support and comfort, yet minimal volume in the shoe. The prefabricated JumpStart Softback™ AFO provides lightweight, comfortable control of mild to moderate toe walking and knee hyperextension. The posterior strap and pad combination work together to strongly resist plantarflexion while encouraging increased dorsiflexion. Both products are backed by Cascade's full 90-day warranty. We also offer a quick turnaround time, competitive pricing, and higher profits for your business. You cast, we fabricate. Call or email for a catalog. CFAB RESOURCES: Apis Footwear Co.
Mt. Emey OTS foot orthotics provide the ultimate support and comfort for patients while simultaneously yielding the highest profit margin for practitioners. Our intention was to create a dually satisfying product—one that could captivate the patient while economically thrilling our practitioners. Fabricated with the patient's comfort as an utmost priority, we developed a supreme cost-effect product while maintaining our durable, market-leading materials to ensure a long-lasting experience. Our orthotics have built-in arch support and heel pads for heightened support, tri-lam layer cushioning with our own EVA base for unique comfort and durability, and an extremely durable and firm shell for protection and corrective support. At a low price per pair, you can begin to introduce a new line of comfort for both you and your patients. CFAB RESOURCES: Spinal Technology, Inc.
Spinal Technology is a leading central fabricator of spinal orthoses, upper- and lower-limb orthoses, and prostheses. Our ABC-certified staff orthotists and prosthetists collaborate with highly skilled, experienced technicians to provide the highest-quality roducts, fastest delivery time (including weekends and holidays), as well as unparalleled customer support in the industry. Spinal Technology is the exclusive manufacturer of the Providence Nocturnal Scoliosis System®, a nocturnal bracing system designed to prevent the progression of scoliosis, and the patented FlexFoam™ spinal orthoses. There is no cost to participate in this study. Subjects can receive up to $500 for their participation and the benefit of an Alps iForce. The prosthetist will receive the prosthesis at no cost. This includes a Variflex foot, a finished flex interface graphite frame socket, iForce, two liners, two suspension sleeves, and 12 socks. You will have access to the data for clinical use after the data collection is complete. Call or email Jason Kahle, CEO of OP Solutions, at jason@opsolutions.us. For users who revel in extreme activities, Freedom Innovations' Maverick fiberglass feet will exceed their highest demands in all terrains to take them wherever they want to go for whatever they want to do. Made with a lightweight fiberglass composite in an innovative heel/keel design, Maverick feet offer durability and flexibility without compromising on product weight or energy storage and return. The new and improved independent adjustment features on the Triple Action® adult ankle joint help facilitate fine-tuning of ankle alignment, resistance, and range of motion to mobilize the ankle and help support the knee. For more information about the Triple Action and other Becker products, contact our customer service department or visit our website. The High Density (HD) Gel product line is ideal for those patients transitioning from silicone to gel liners. The firm nature of the gel provides active amputees with a great degree of control while still providing superior comfort. ALPS HD Gel is available in several of our liners and sleeves. Please contact us for a sample of our gel strips to experience it for yourself. Treat sagittal plane compensations with knee extension and flexion deficits. Prevent drop-off at terminal stance by resisting or stopping tibial progression over the foot. Generate plantarflexion assistance resulting in increased third rocker power, contralateral step length, and single-limb stance stability. It's available in dynamic and static options in pediatric and adult sizes. The S.T.O.P. orthosis is an extremely versatile spinal immobilization device fabricated in multiple configurations. It is SADMERC classified. Bivalve with molded tongues for maximum adjustability. Anatomically contoured to facilitate superior fit on a wide range of patients. Removable, washable lining for increased comfort and compliance. Available with rigid molded side panel to increase lateral stability. WalkOn® AFOs are prefabricated from advanced prepreg carbon composite material designed to help users with dorsiflexion weakness walk more naturally. WalkOn AFOs are lightweight, low profile, and extremely tough. Their dynamic design can help patients achieve a more physiological and symmetrical gait, offering fluid rollover and excellent energy return. WalkOn offers a full range of AFO sizes and designs including the WalkOn Reaction Junior pediatric sizes. Fast and easy to fit, the WalkOn footplate is trimmable and can be shaped with scissors, often requiring only one office visit. Call us or visit www.professionals.ottobockus.com for details. Introducing the RUSH ROGUE®! Everything you love about the existing RUSH Foot® Collection, featuring even more comfort, improved performance, and +/- 8° of torsion. The ROGUE provides the most realistic and dynamic foot and ankle motion available. The vertical loading pylon provides comfortable relief from high-impact loading, allowing the user to push the foot to the limits. The roll-through characteristics of the foot provide exceptional energy return with no dead spot. What are you waiting for? Go ROGUE. Go RUSH. To learn more visit www.rushfoot.com. The MAGLOCK 2.0 and MAGLOCK 2.0 Plus ease the frustration of donning a pin lock liner for patients with transtibial or transfemoral amputations and K1-K3 activity levels. 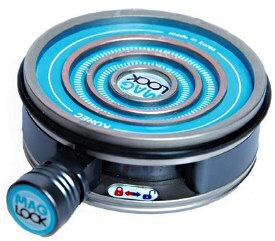 The MAGLOCK 2.0 delivers up to 60 lb. of force and the MAGLOCK 2.0 Plus delivers up to 90 lb. of force. The large distal target allows the patient to be 10 degrees off center and still achieve suspension. The ultimate products for patients who have dexterity issues, issues with pin alignment, require a caregiver, and much more. No wires, no battery. Our accommodative foot orthotics are specially designed for patients with foot deformities. We offer a variety of materials for foot conditions such as neuropathy, Charcot foot, edema, or amputation, or conditions resulting from health issues like obesity, diabetes, sports injuries, or heart conditions. Custom-made foot orthotics provide support and relief wherever necessary. Apis provides qualified customers with a free 3D scanner to eliminate impressions or casting—now it's just a click. Fulfill all your pedorthic needs under one roof. Call our friendly customer service representatives for more information or free samples. Get the optimal balance of flexibility and rigidity with Prepalon™. Prepalon is an elastomer with continuous fiber blend technology (CFET). Flex, which comes from soft elastomer, offers optimum tear strength. Rigidity, which comes from continuous fiber, offers structure and support. No need for string to prevent the joint from stretching. The tendon design offers smooth movement while providing support in rotation and the sagittal plane. It offers superior rotational control, it's easy to fabricate, and is made in the USA. Whether you practice in a state that has licensure requirements or are moving to one that does, find everything you need with ABC's interactive state licensure map. With detailed information about each state's requirements and costs, and links to important documents and applications, we've got you covered! Hi-Tech and Fusion 360 are excited about our new product that you will want for all our prosthetic patients. The Fusion 360 cover is a highly functional cover that moves with the components, not against them. Measure. Choose. Fit. It's that simple. It comes in lots of fun colors. No more injuries from sharp edges or nuts and bolts. Easiest to install in 15 minutes or less. Works with most prosthetic feet and componentry on the market. Works with most vacuum systems. Check out the Fusion 360 on our website and download a PDF brochure and technical information. Today's prostheses from iFIT—Immediate Fit, Innovative Technology—give prosthetists new options for their patients. iFIT Prosthetics is a Veteran-Owned Small Business (VOSB). The MultiStatic Joint enables fast, efficient, and effective static treatment of contractures utilizing High Load Brief Stretch (HLBS) principles for both children and adults. Improvement and rehabilitation of joint mobility and in resting posture are benefits in achieving therapy objectives. They are available in 12mm, 16mm, and 19mm widths. Single-axis Free Motion Joints are available in 12mm and 16mm widths. For more information, contact customer service or email info@allardusa.com. Introducing Pro-Flex® LP Align, which couples up to 2¾" of heel height adjustability with the mechanical power of the three-blade Pro-Flex design. So users can maintain proper alignment across a variety of everyday footwear, from sandals to sneakers to dress shoes. Visit www.ossur.com/pro-flex-family or ask your Össur representative about a Pro-Flex demo today. Experience the power of Opie Anywhere, OPIE Con 2019, and OPIE dashboards and analytics.